TTN was invited to a familiarisation trip to Switzerland and travelled from Zurich to Crans-Montana in the Valais canton and then to Lugano in Switzerland’s Ticino region. We are travelling east from Crans-Montana en route to Lugano on Lake Lugarno in the canton of Ticino. 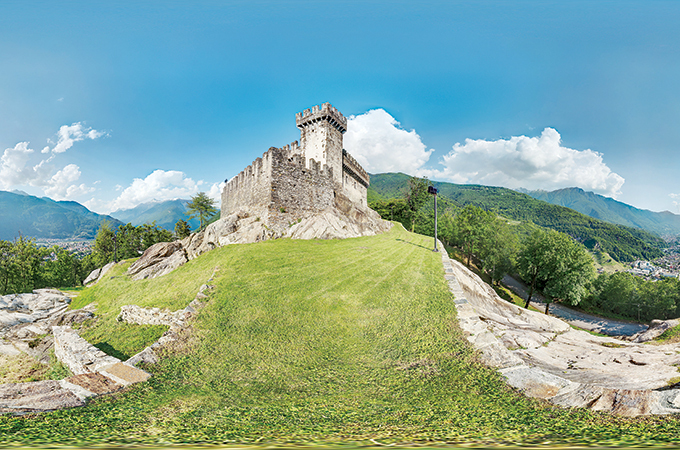 Bellinzona is the capital of Ticino and its three medieval castles make for a Unesco World Heritage site. The train passes eastwards through deep river valleys, pine-clad forests and mountains and one can see many vineyards on the south-facing slopes. There are the traditional Swiss chalets and villages peppered along the landscape and one can see a glimpse of the Aletsch Glacier, the longest and most voluminous glacier in the European Alps. We are told that the glacier covers 23km of deeply crevassed ice, precipitous waterfalls, rocky outcrops and jagged terrain close to the source of the River Rhone. Ominously, the glacier is shrinking every year as a result of global warming. Eventually one turns almost due south into Ticino which is very much Italian Switzerland in all its glory as everywhere one looks it is Italianesque and where more than 80 per cent of the population speak Italian. The publicity material highlights the climate, the lakeside promenades and majestic scenery but there is a very much of a twist to Ticino, in its amalgam of diverging culinary, cultural, and linguistic charms and a sense of difference to northern Switzerland. At some places on the journey the train crosses into Italian territory on the meandering route down to Lugano which is close by to the Italian border. This is taking the slow train on the panoramic Cenovalli railway, the ‘one-hundred valleys’ route to Domodossola with its acute curves overlooking streams, Alpine forests, vineyards and precipitous deep valleys whilst crossing 83 bridges and entering 34 tunnels. Historically, Ticino was the physical buffer between the Swiss-German cantons northwards and Italy to the south with the dukes of Milan and lords of Como having alternate political control down the centuries. Where else but Ticino can one traverse a glacier in the morning, have a siesta under a palm tree in the afternoon overlooking the various lakes and live the dolce vita in the evening. Lugano stages open-air concerts in July and by August the Locarno film festival is in full swing. The film festival is perhaps Switzerland’s largest cultural event dating back 70 years and a must for aficionados of auteur cinema. So culture vultures can sate their intellectual appetites as well as their culinary tastes in one location. Herman Hesse, the Nobel Prize winner moved to Ticino and waxed lyrical about the region and something of a commune developed in the area with people attracted by its sense of place and intellectual and artistic freedom. Lugano is plush and sophisticated and the largest city in Ticino and an important banking centre too. Chic boutiques, cobbled streets, pavement cafes, high-end shopping and an air of refined sophistication pervades. One would not be surprised to meet anybody in Lugano such is the sense of urbane quality and chic. The lobby of the palatial Hotel de La Paix in Lugano overlooking the lake, had an art exhibition running almost as the norm. 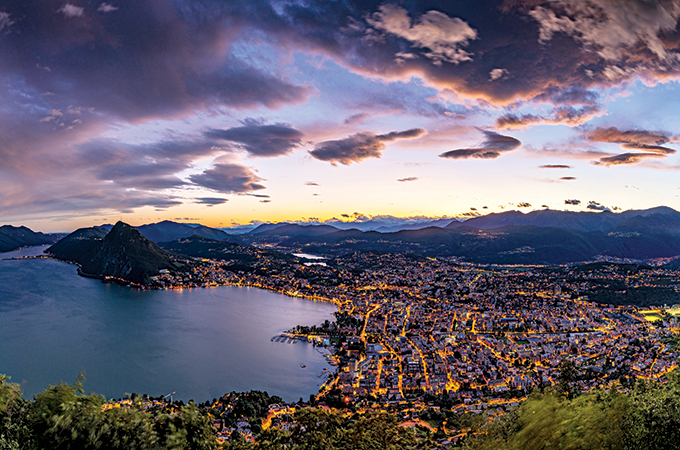 In parallel there are 20 galleries and museums in Lugano to further stimulate the mind. A few minutes away by foot is the magnificent Hotel Splendide Royal, a nineteen- century palazzo where royalty, presidents and VIPs stay in exclusive and discreet luxury. Full floor windows and balconies and terraces overlook the lake and one can imagine the high society across several generations enjoying the views and refined ambience of Lugano. The open-air museum called Swissminiatur overlooks the lake and is a unique area of more than 120 painstakingly constructed miniature buildings built to a scale of 1:25 representing the prominent buildings, monuments and transport links of Switzerland. Authenticity and attention to detail is implicit with locomotives moving along the tracks and everything from the William Tell monument to Lausanne cathedral in glorious detailed miniatures. Established by the Vuigner family in 1959, the traditions now carry into a third generation and thus must-see attraction is very popular with Arab visitors and families. Another popular place to visit near Lugano is Fox Town. Essentially, Fox Town is a factory outlet concept but with a difference due to its strategic location, customer hinterland, sheer quality and is a mere 7 km from the Italian border. There are more than 250 world brands in 160 stores plus bars, restaurants, a casino and relaxation areas. If you must shop then Fox Town it should be. One cannot mention Switzerland without the traditional cable car and from Lugano one can ascend and descend Monte Bre with incredible views of the lake and mountains. Once you reach the top there are restaurants and bars to relax and enjoy the stunning views. So farewell Switzerland as one boards the train to Zurich from Lugano and enters the tracks for the new Gotthard Base Tunnel to be whisked at tremendous speed northwards. Like a giant kaleidoscope, Switzerland with its multilingualism, cultural diversity, 26 cantons with immense federal powers, and majestic geography is magical.